Porsche doesn't like to disappoint its loyalists. The Porsche 911 R was an instant smashing success. Porsche also learned a very valuable lesson from the project: enthusiasts still want six-speed manuals over dual-clutches and that unnecessary and unloved seven-speed manual. Low and behold, the updated 911 GT3 now offers a six-speed manual option alongside the dual-clutch. But we’re hearing rumors coming from Road and Track as well as Porsche enthusiast site Rennlist about a potential upcoming 911 GT3 trim called the Touring Package. 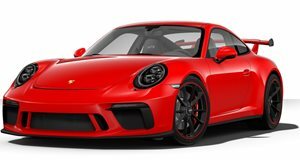 Back in March, Rennlist users noticed on the German-market 911 GT3 configurator a reference to the Touring Package, but Porsche quickly took that down. R&T also reports that UK’s Car magazine got wind that Porsche will indeed offer a 911 GT3 Touring Package that has, essentially, the same aero pack as the 911 R and will be manual-only. But wouldn’t this simply be the sold-out 911 R all over again (not that we’re complaining)? Pretty much, yes. Porsche ain’t stupid and knows it can easily sell plenty more 911 Rs but doesn’t want to devalue their already dramatically increased prices on the collectors’ market. Therefore, the 911 GT3 Touring Package is the ideal solution, but it would differ from the 911 R in a few areas. Aside from its own unique badging and paint job (meaning no retro stripe), the Touring pack will likely feature several creature comforts making it more suitable for road trips, as opposed to outright track use. The 911 GT3’s rear wing would also be eliminated. So far, Porsche has refused to comment on the matter, but sources believe the 911 GT3 Touring Package will be sold in the US as well as other markets. Only 991 examples of the 911 R were built, but we have no way of knowing right now how many Touring Packages are planned. Either way, this is very good news.